You scramble for the sectional chart and guess what, that area of ground you’re flying over carries a “P” designation, and believe me, it’s not because the guys that live down there are Portuguese. You’ve just busted a Prohibited Area, and Uncle Sam’s Air Force wants to have a word with you…NOW. This is what an “intercept” looks like. So now you’ve got the F–16 TIGHT at your three o’clock, what to do next? 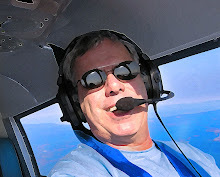 Well, if you think you know, then you ought to ACE the newest AOPA/Sporty’s Safety Quiz, found here. Flying…it’s not for idiots anymore.